Actors’ Playhouse at the Miracle Theatre is proud to present the world premiere of the new musical, Havana Music Hall. Tickets are on sale now for the exciting new show that debuts October 10 – November 18, 2018. 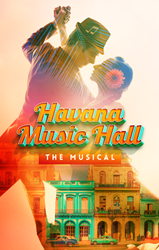 Actors’ Playhouse at the Miracle Theatre is proud to present the world premiere of the new musical, Havana Music Hall. This exciting new show centers around the lives of Havana Music Hall’s best-known musicians who are just about to get their big break before Fidel Castro seizes power. Havana Music Hall will debut at Actors’ Playhouse October 10 – November 18, 2018. Set in 1958 Cuba, the highly anticipated new musical, with book by Carmen Pelaez tells the story of husband and wife musical team Rolando and Ramona Calderon who are on the verge of breaking through to the world’s stage when the Cuban Revolution tears apart the only life they have ever known. Almost sixty years later, we find the couple trying to forget the past in the now devastated Havana Music Hall, but others won’t let them. Directed by On Your Feet! co-choreographer Maria Torres, with a story and original score by Richard Kagan, the new musical captures the pain and joy of the immigrant experience like nothing before and will also have audiences dancing in the aisles. Featuring new songs such as "Escape to Havana," “Place of My Birth,” “Todo Es Bueno en Cuba” and “I Have My Voice,” this fast-paced new musical brings audiences inside the famed Havana Music Hall as hearts break and spirits soar against all odds. Actors’ Playhouse Executive Producing Director Barbara Stein and Artistic Director and Havana Music Hall Creative Consultant David Arisco and are delighted to bring this exciting world premiere that captures the power of life, the joy of music and the humanity of friends and family to Miami audiences. The creative team for Havana Music Hall includes Lyric Translation by Cuban Musicologist Jose “Perico” Hernandez, Music Supervisor Larry Blank, Music Director Manny Schvartzman, Dramaturg Carmen Rivera, Set Design by Paul Tate dePoo III, Costume Design by Ann Closs-Farley and additional Casting by Binder Casting and Acting Consultant Seán Griffin. Tickets are now on sale to the general public, with prices ranging from $30 to $75. Tickets can be purchased by calling (305) 444-9293, visiting https://bit.ly/2Kbt2Zz, or at the Actors’ Playhouse Box Office (280 Miracle Mile, Coral Gables, FL 33134). Group discounted rates are offered for 15 patrons or more through the group sales department at (305) 444-9293 ext. 610 or on http://www.actorsplayhouse.org. Preview performances will be held October 10 – 18, 2018. The show will open on Friday, October 19, 2018 at 8 p.m. and the final performance takes place November 18, 2018. Evening performances will be held Wednesday through Saturday at 8 p.m., with afternoon matinees on Saturday at 2 p.m. and Sunday at 3 p.m. A special weekday matinee is scheduled on Wednesday, October 24, 2018 at 2 p.m. Actors’ Playhouse Artistic Director David Arisco will lead a group discussion with the cast following the performance on October 26, 2018 as part of the company’s “Second Fridays” series. For more information and the latest updates, visit http://www.havanamusichall.com and follow on Facebook and Instagram @HavanaMusicHall. Founded by Dr. Lawrence E. Stein, and under the leadership of Executive Producing Director Barbara S. Stein and Artistic Director David Arisco, Actors’ Playhouse is an award-winning nonprofit regional professional theatre company celebrating 30 years of excellence. Located in the historic Miracle Theatre on Miracle Mile in downtown Coral Gables, Actors’ Playhouse is a Florida Presenting Cultural Organization and one of 13 major cultural institutions in Miami-Dade County. The company produces five Mainstage and four professional Children’s Theatre productions annually, a year-round Theatre Conservatory and Summer Camp Program, educational arts outreach programs, and the Young Talent Big Dreams countywide youth talent contest in partnership with The Children’s Trust. http://www.actorsplayhouse.org.